After the morning skate and during Alain Vigneault’s press conference, the head coach announced that Derek Stepan will miss four to six weeks due to his broken ribs. Stepan was hit late into the boards by Bruins winger Matt Beleskey and suffered the injury on that play. This is just the second time in his career that he will miss regular season games, as Stepan has been one of the “iron men” on this team. This is brutal. Saying that he is a big part of the team is an understatement. Stepan is the second line center, plays 17 minutes a night in all situations, scores points, plays excellent defensive hockey, and he’s been pretty clutch at times in his career. There are big skates to fill for the next month or so. Kevin Hayes will continue to center the second line for the time being. 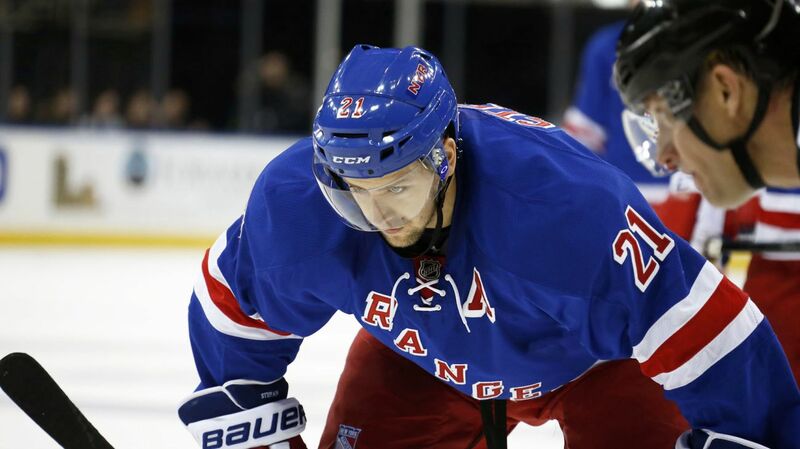 Derek Stepan will almost definitely be placed on IR, which will free up some cap space for a call-up. But I wouldn’t rule out a trade, it could happen. Chris Kreider has been bumped down a line after his disappointing start to the season, but it give Oscar Lindberg a scorer on his line and two good wingers. So maybe that will work. I don’t see Etem as a fourth liner, so it’s a bit disappointing to see him relegated there, but that line has been getting a lot of ice time lately. I’m also surprised to see Stalberg on the second line, mainly because I thought he was in AV’s doghouse. If he can use his speed effectively and get in on the forecheck, he’ll be fine. It’s about damn time Girardi and McDonagh were separated again! Girardi has dragged the captain down with his sub-par skating, passing and his blown coverages at times. Kevin Klein has been the best defenseman this season, and truly deserves first pairing minutes. Dylan McIlrath was probably the lone bright spot in the game against the Flyers, and he has played well this season. So it’s disappointing to see him out of the lineup. He deserves to play. Henrik Lundqvist remains in goal. Puck drop is at 7 PM. Posted on November 30, 2015, in Rangers Updates and tagged Alain Vigneault, Antti Raanta, Cam Ward, Carolina Hurricanes, Chris Kreider, Dan Boyle, Dan Girardi, Derick Brassard, Derick Stepan, Dominic Moore, Dylan McIlrath, Emerson Etem, Henrik Lundqvist, Jarret Stoll, Jesper Fast, JT Miller, Justin Faulk, Keith Yandle, Kevin Hayes, Kevin Klein, Madison Square Garden, Marc Staal, Mats Zuccarello, MSG, New York Rangers, New York Rangers blog, Noah Hanifin, NYR, Oscar Lindberg, Rangers, Rangers blog, Rick Nash, Ryan McDonagh, Stepan injury, Viktor Stalberg. Bookmark the permalink. Leave a comment.